My late stepfather took so much joy in rum balls every year. His sweet daughter-in-law always made big batches of those tipsy treats for the holiday season. Her recipe used dairy, so I never had the opportunity to try them. But over a decade ago, I stumbled across a cocoa rum balls recipe that was naturally dairy free! I’ve made some tweaks to this recipe over time, and have tried several options. So today, I’m giving this recipe post for dairy-free and vegan cocoa rum balls a big update. Happy holidays! Wafer Cookies – I’m talking about cookies like Nilla Wafers, but that particular brand contains dairy. Look for store brands (some are dairy-free). For dairy-free and gluten-free (not vegan), Kinnikinnick Vanilla Wafers are great. In a pinch, you can use any dairy-free vanilla cookies. Enjoy Life Crispy Sugar Cookies (also gluten-free and vegan) are a great option, and I’ve even read that the other type of vanilla wafers work well! Nuts – I’ve only used pecans or almonds, but other nuts might be equally tasty. I wouldn’t hesitate to try walnuts or cashews. If you need nut-free, you can try sunflower seeds or pumpkin seeds, but the flavor might be a bit more pronounced. Rum – A regular rum can make these dairy-free cocoa rum balls a little too strong for some tastes. I recommend using a light rum or a flavored rum. We think vanilla or coconut go the best, but you might like a spiced rum. 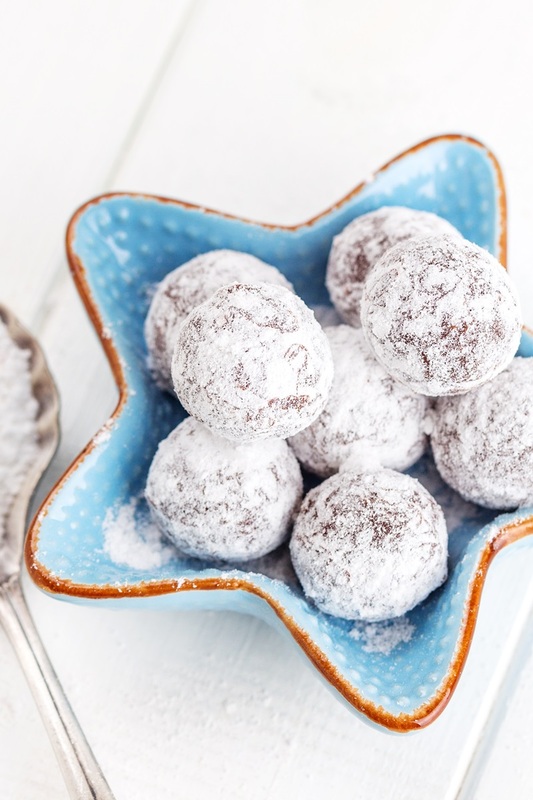 Coating – You don’t have to roll the cocoa rum balls in powdered sugar. 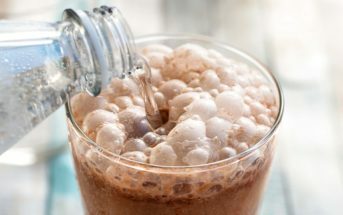 Some other great coatings include granulated or sparkling sugar, cocoa powder, dairy-free hot cocoa mix, or shredded coconut (great with the coconut rum!). By ingredients, this recipe is dairy-free / non-dairy, egg-free, optionally gluten-free (see Recipe Tips above), peanut-free, optionally soy-free, optionally vegan, and vegetarian. 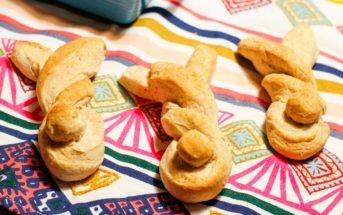 These festive treats can be enjoyed the same day, but are best when made a couple of days in advance. This gives the flavors time to develop. The Prep time noted is hands-on time only! Put the cookies and nuts (unless you prefer the texture of coarse nuts) in your food processor, high-power blender, or spice grinder (in batches) and pulse until crushed into crumbs, or even powdered (depending on the consistency you prefer). Pour the ground cookies and nuts into a large bowl. Add the ¾ cup powdered sugar and cocoa powder and stir to combine. 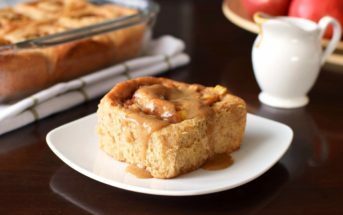 Add the ½ cup rum and liquid sweetener, and stir until evenly combined into a dough. Have the shot of rum, because the bottle is now open and you deserve it. If it's morning, put it in your coffee, because ... you know. Put the remaining 2 tablespoons powdered sugar in a shallow dish. 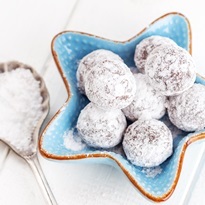 Shape the dough into 1-inch balls and roll each ball in the powdered sugar to coat. For the best flavor, store the rum balls in an airtight container for 2 to 3 days prior to serving. If desired, you can roll them again in powdered sugar before serving. Non-Alcoholic Option: Substitute ½ cup orange juice and 1 teaspoon orange zest for the rum. For More Specialty Recipes Get My Book, Go Dairy Free! I checked your recipes to see if they were meat, dairy and oil (fat) free. I’m not sure that these are plant based in the strictest sense. These are more typically vegan. Thank you for this recipe! 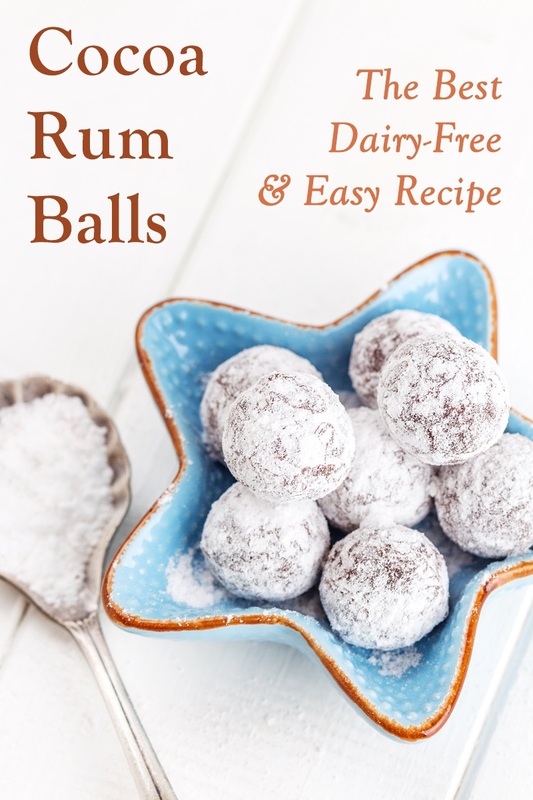 Rum balls were my mom’s specialty, and I never could make them taste right without dairy! I will be trying them tomorrow!